Just a reminder, the deadline for the Featured Artist Contest at Altered Esthetics is August 31, 11:45 PM. We’re looking for single panel cartoons for our Comic Art Show in 2014. The Comic Art application is located at http://www.alteredesthetics.org/FAC . 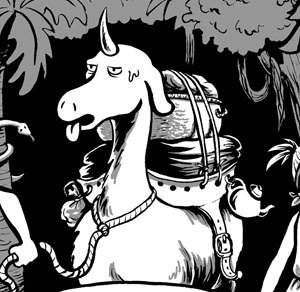 Cartozia Tales Kickstarter — now with more rewards! A Kickstarter campaign is underway for Cartozia Tales, an all-ages fantasy series based on a collaboratively-created map. The comics in the anthology are filled with imaginative creatures, memorable characters, secret messages and fantastical landscapes. It has been incredibly fun to work on, and the contributors’ enthusiasm really shows in the final product. Our regular contributors are Sarah Becan, Lucy Bellwood, Isaac Cates, Shawn Cheng, Tom Motley, Mike Wenthe, Jen Vaughn and me, Lupi. Each issue also contains stories by FABULOUS GUEST ARTISTS, including Dylan Horrocks, Jon Lewis, James Kochalka, Adam Koford, Kevin Cannon, and more. The vicuñicorn: invented by Adam Koford, named by Mike Wenthe, and drawn by me. Read more about the project, our process, and the guest artists we have lined up for the next couple issues. For a pledge of only $28, you can get a full color 8×10 print of one of our covers or promo images. For $36, you get an original custom watercolor portrait on a trading card from ME! Also, digital subscriptions are now being offered as a reward, for those of you who don’t want to pay for shipping, or don’t have a lot of room on your shelves for books. Great option for readers outside the U.S.! Have a new cartoon on You Tube. Autoptic Festival and Related Events This Week! 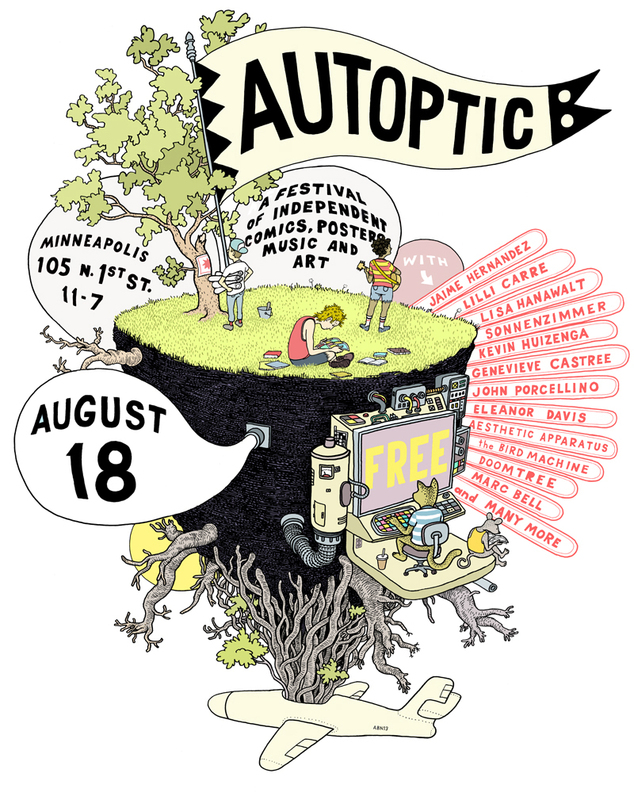 The Autoptic Festival is happening in Minneapolis this Sunday, but there are related events happening all week! Here are the event listings. Altered Esthetics is gearing up for its 2014 Art Shows, including a new Comic Art Show. This show will be a stripped down version of Rock Ink Roll and Lutefisk Sushi. Instead of focusing on publications and mini-comics, this show will strip comics down to it’s very atom, the single panel comic. Think Family Circus. Think Far Side. 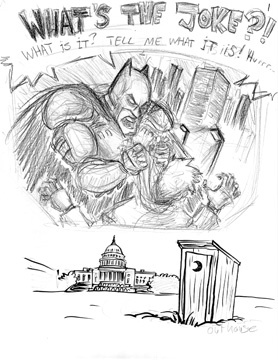 Think your Friendly Neighborhood Political Cartoonist! Altered Esthetics is looking for a Featured Artist for this show. This year we will be having a Featured Artist Contest. To apply to be a Featured Artist, draw up a single panel cartoon as submit it using this form. Be sure to select “Comic Art” as the show you are submitting for. The best cartoon will be used for the shows promotional material, and the cartoonist will be the Featured Artist for the show! More information about AE’s Featured Artist Contests can be found here. The deadline is August 31, so get drawing! Come on down to the open studio on Saturday, August 17, noon to 4 pm, at the Minnesota Center for Book Arts. 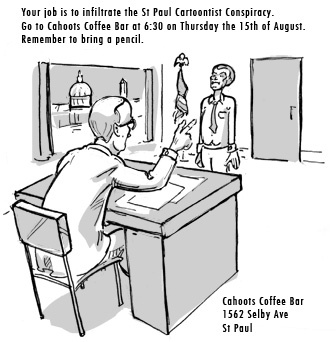 Meet, talk, and draw with a few of your fellow cartoonists. We’ll be at the flexi-space (low tables). The coffee shop will be open. There are outlets for your devices, plus coffee-shop wi-fi. There is free parking in the MCBA lot immediately east of the building. If the lot is full, go to the metered street parking on 3rd Street (one block south of Washington Ave.) for 25 cents an hour, or to the higher-priced meters on the other streets. Or, walk or ride your bike. This is an open studio — all are welcome. Feel free to hang out, draw, or whatever. Saturday, August 17, from noon to 4 pm, at the flexi-space (low tables).